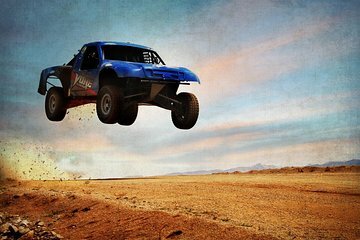 Enjoy the thrill of off-road desert driving on this guided race-truck experience in Las Vegas. After an orientation, instructional video and demo lap, blaze a trail along a world-renowned, arena-style, short-course track. There are five major jumps including one that reaches over 20 feet in the air. It’s one of the best driving experiences in Sin City. The use of helmet plus a Las Vegas hotel pickup and drop-off are included. Awesome experience! If you're into this kinda stuff, I highly recommend to check this off your bucket list when visiting Las Vegas. I would do this again, the staff was very friendly from the pick up at the hotel, at the facility and back to the hotel. Thank you! this was a amazing experience for my husband... jason picked us up and robbie took over he was super cool and very knowledgeable these guys rocked it and mike was the other guy we had mike drive us home i would recommend this experience to anyone!